Use this calculator to estimate your monthly mortgage payment, including taxes and insurance. 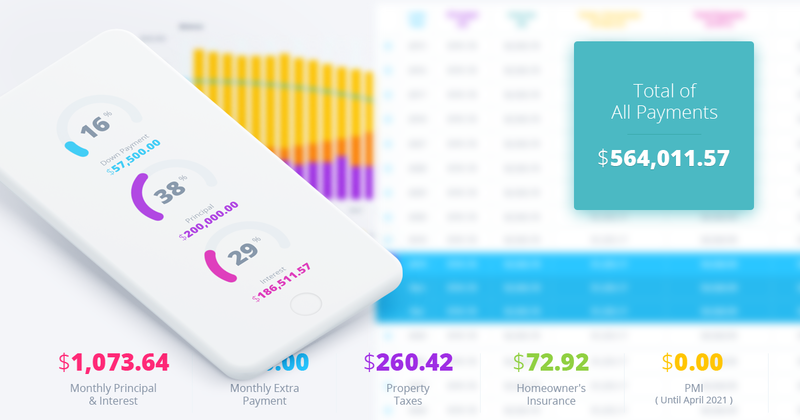 Simply enter the price of the home, your down payment, and details about the home loan to calculate your payment breakdown, schedule and more. These calculations are estimates and are not guaranteed for any particular loan. Click below to print or share a link to the mortgage calculator (with all your numbers pre-filled) below! × Share URL has been copied successfully. The information provided by this calculator is for illustrative purposes only. The default figures shown are hypothetical and may not be applicable to your individual situation. Be sure to consult a financial professional prior to relying on the results. The calculated results are intended for illustrative purposes only and accuracy is not guaranteed.